Let's take a look now at how the entire licensing process works. Let's take a look now at how the entire licensing process works. The exact process that takes place is different depending on whether the Terminal Server is configured to use device-based or user-based TS CALs. When a Terminal Server is configured to use TS Device CALs (Start | Administrative Tools | Terminal Services Configuration | Server Settings | Licensing), each client device needs to have its own license. Terminal Server CALs are purchased and installed into the license database on the (previously activated) TS Licensing Server. The TS CALs are activated via the Microsoft License clearinghouse. The activated licenses remain on the license server, waiting for assignment to client devices. Since the Terminal Server is in per device licensing mode, the Terminal Server checks for the device's TS CAL (in the form of a digital certificate). The user's credentials are validated. If the user successfully authenticates, the Terminal Server contacts the license server a second time. This time around, the Terminal Server informs the license server that the TS CAL that was sent to the client should be marked as "valid." If the user did not successfully authenticate, (i.e. the connection was from an inappropriate user), the Terminal Server will not contact the license server, and the license that was sent out will not be marked "valid." The Terminal Server contacts the license server. Since the licensing server marked the CAL as valid the first time the user authenticated, the client device's temporary CAL is upgraded to a full CAL. If, for some reason, all of the license servers have depleted their inventories of TS CALs, the client device keeps its temporary 90-day TS CAL certificate. As long as the 90-day certificate has not expired, the client device can still connect, even with no available licenses on any license servers. An unlicensed client device will always be granted a temporary 90-day TS CAL at the time of its first connection. Only after successful authentication and a second logon is the temporary TS CAL upgraded to a full TS CAL. This two-stage licensing process is used to ensure that TS CALs are only assigned to authenticated users. Previously (before hotfix 287687 or Windows 2000 Service Pack 3) any user that connected was assigned a full TS CAL, even if he did not belong on the system. The full TS CAL certificate was granted at connection time, before the logon screen even popped up. If a user thought, "Oops, I don't belong on this system!" it was too late—his client device had already received a full TS CAL certificate, even if the administrator never meant for him to access the system. This circumstance often led to license servers running out of TS CALs. During this process, if the license server does not respond to the Terminal Server, the Terminal Server will try to connect to one of the other license servers from the list of servers it maintains in the registry that was built as a result of the license server discovery process. If it can't connect to any of them, it will start the license server discovery process again. If a client device does not have a TS CAL and the Terminal Server cannot contact a license server, the user's session will be denied. The only exception to this is for new Terminal Servers. In Windows 2003, you have a 120-day "grace period" during which a Terminal Server will function even if it cannot contact a license server. However, 121 days after you install Terminal Services onto a Windows 2003 server, that server must be able to contact a licensing server or no new users will be able to connect. All of this action takes place a soon as the connection is made—before the user even authenticates! As mentioned earlier, when a client device receives a TS Device CAL from a Terminal Server, it receives it in the form of a digital certificate from a license server. For this reason you must activate the license server with the Microsoft clearinghouse (which is just a certificate authority). The digital certificate is an actual certificate copied to the client device (even with Windows CE). Once a client device connects to a Terminal Server, a TS CAL digital certificate is transferred from the license server to the client device. The license server loses one of its licenses from its inventory, and the client device has the digital certificate that it can present to any Terminal Server on future connections. Anyone who has been in the computer industry for more than five minutes can probably spot a potential flaw in this plan. Client devices tend to break. Windows-based terminals have their ROMs reflashed. Operating systems are reinstalled on workstations. PCs are reimaged. Whenever this happens, the TS CAL digital certificate stored on the client device is lost forever. The TS CAL doesn't exist on the license server after it's transferred to a client device. When that client connects back to a Terminal Server, it has no digital certificate to present. The server thinks that it has no license, and instructs the license server to issue a new TS CAL in the form of a new digital certificate. In effect, that one client device ends up consuming two TS CALs—the old one that was lost and the new one that was just issued. If the client device were reset again, a third TS CAL would be used. The license server also tracks the expiration date of TS CALs. If for some reason the client's CAL is never renewed and expires, the license server returns that TS CAL to the inventory of available unused licenses. If a client device with a TS CAL were to blow up or be rebuilt, the license server would automatically add the TS CAL back into its available license pool after it expired (a maximum of 89 days). If the Terminal Server is not able to obtain a TS CAL renewal when the client device's TS CAL certificate expires after the 52 to 89 days, the client is denied access. A temporary 90-day certificate cannot replace a full certificate that has expired, but this shouldn't ever be a problem for you (unless you don't have enough TS CALs). Assume that a client device successfully authenticates to a Terminal Server and is granted a full TS CAL certificate that was (worst case) randomly selected to expire at the 89 day maximum. When it passes down the certificate, the license server decrements its total TS CAL license count by one, also noting that particular certificate's expiration date. Now, assume that a catastrophic event occurs at the client, causing its local operating system to be reinstalled and its local TS CAL certificate to be lost. When that client authenticates to a Terminal Server, the Terminal Server will request a new TS CAL certificate from the license server and the license server (again) decrements its TS CAL inventory by one. At this point there have been two TS CAL licenses given out to that one client, but the first one will never be renewed because the certificate was lost when the client was rebuilt. After 89 days (the randomly selected duration of the first certificate), the first TS CAL is returned to the pool by the license server. The administrator in this situation probably bought just enough TS CALs to cover the exact number of client devices. He did not buy extras to cover the 52 – 89 day period during which one client device had two CALs assigned. By purchasing the exact amount of TS CALs, the license server would not have any more TS CALs to give out when the client device asked for the new TS CAL certificate after the first was lost. In this case, the license server would grant a temporary 90-day TS CAL certificate to the client device because the client device appears to the server as a brand new machine. Because the temporary TS CAL certificate is always valid at least one day longer then the full CAL certificate (90 days versus a maximum of 89 days), the old, lost full TS CAL will always be returned to the inventory on the license server at least one day before the temporary TS CAL certificate would expire. For example, after day 88, the client device's temporary TS CAL certificate will expire in 2 days, but the license server is tracking the expiration of the full TS CAL that was originally granted for 89 days. That full TS CAL only has 1 day left before it expires. The following day, when the client device's temporary TS CAL certificate has only 1 day remaining, the license server will add the original TS CAL back in its inventory pool, making it available to grant to the client as a permanent license for another random period of 52 – 89 days. True geeks will enjoy tracing the entire licensing flow in Windows 2003 Terminal Server environments in Figure 4.4 on the facing page. Throughout this license distribution and acquisition process, we have discussed two different license timeframes. While both are related to Windows 2003 Terminal Services licensing, they are actually completely different. The first item relates to the presence of a license server. If a Terminal Server cannot locate a license server, it will still allow unlicensed client devices to log on. The Terminal Server itself does not grant 90-day temporary licenses if it cannot find a license server. Instead, if a license server cannot be located, the Terminal Server simply "looks the other way" for 120 days. After the grace period ends, unlicensed client device connections are refused. This 120-day countdown begins the first time a Terminal Services client device connects to the server. These temporary licenses can only be replaced by full TS CAL licenses—they cannot be replaced by additional temporary licenses. There is no limit to the number of temporary licenses that a license server can grant. 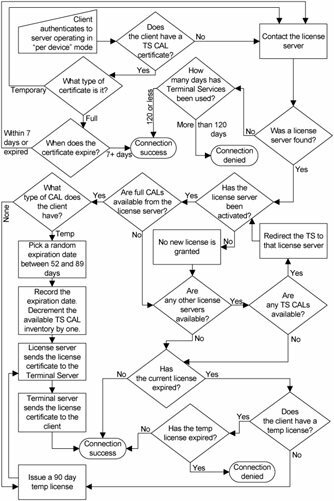 Also, the 90-day timer for the expiration of the TS CALs is client specific, meaning that different temporary licenses can expire on different days—even if they were all granted by the same license server. Everything discussed in the previous section is applicable only when Terminal Servers are configured in "per device" licensing mode. When a user connects to a Terminal Server configured in "per user" licensing mode, a different process takes place. That's right. All this TS CAL digital certificate, temp license, transfer mumbo-jumbo only applies when Terminal Servers are configured for "per device" licenses. With per user licenses, all you have to do is make sure that the Terminal Server can find a license server. (The license server doesn't even have to be activated!) Other than periodically verifying that it exists, there's no communication between a "per user" configured Terminal Server and a license server. How did this come to be? When Windows 2003 was in beta testing, Microsoft was planning to offer a "per processor" licensing model. At the last minute (with Release Candidate 2), Microsoft changed its mind and decided to go with a "per user" option instead. This decision was a popular move on Microsoft's part. The only problem was that it was so late in the game that Microsoft didn't have time to build the "per user" technical license compliance infrastructure (although you can bet we'll see it in future versions of Windows).